What is the focus of your work? The sector of public service I have aided most involves providing the community, especially young people, with opportunities and activities that allow for personal development, leisure recreation/programs, social enhancement and access to resources. There are many direct similarities between the work that I do and ConnectVA’s mission. Working in organizations that are dedicated to serving the public allows me to fulfill my personal mission of strengthening communities. What do you find most rewarding about your work? Being able to witness the positive changes in young people is a priceless feeling. Whether it is the result of me giving them the help they need, or from inspiring them to help others, it is always great to see youth develop in a positive way. Tell us about your biggest accomplishment in this position – In the 8 months I have been with Community Resources, I have had many successes with large programs and overall initiatives, but the accomplishments I am most proud of are more individualized. Being able to teach a student how to use her skills and passions to help others and to see her project come to fruition was huge for me. The local attention she received and the impact she made on young girls around the world really brought that experience back around full-circle for both of us. In my experience, working with teens always comes with some sort of challenge, even though the good far outweighs them. My major challenge usually involves learning the group of students. Being able to identify strengths and weaknesses within young people in order to help in their progression can only be remedied with time. Through facing this challenge, I have learned that many teens don’t need as much “help” as we give them, and my main focus should be “empowerment”. Fortunately, the design of our programs at Community Resources easily lends to equipping youth with resources and skills to make a difference themselves. We do this through focusing on leadership development and mentoring. What’s coming next for you and/or for your organization that really excites you? I am excited to have just submitted our application to participate in Youth Service America’s Lead Agency Program for our 9th year! Our department facilitates Hanover Global Youth Service Day and works to coordinate service projects with dozens of community partners to engage thousands of youth in a weekend of service. This year’s Global Youth Service Day weekend is April 15th through the 17th. How are you leveraging ConnectVA to achieve your mission? ConnectVA is an excellent resource and network for connecting with agencies and individuals. I have recently benefited from the array of programs and events offered though ConnectVA and its partnerships. I most recently attended the Top 40 Under 40 Non-Profit Spotlight, and the Mentoring Matters event and thoroughly enjoyed the panel discussions and networking opportunities. Anything else you would like to share? 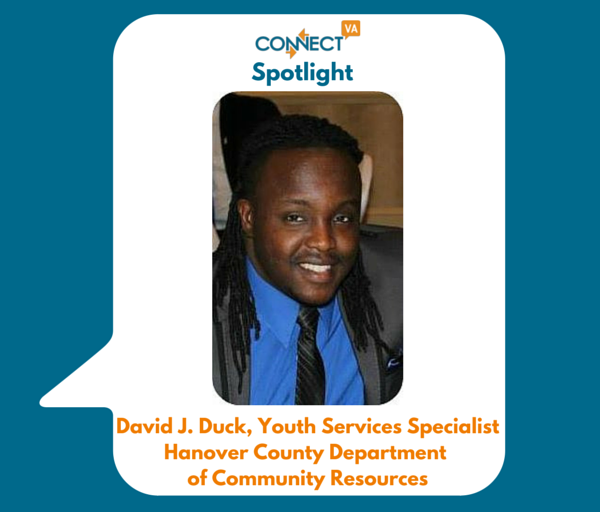 The Department of Community Resources’ mission is to promote Hanover’s people, tradition, and spirit by mobilizing volunteers and maximizing available resources to address community needs. We are excited to continue to serve our community through our youth services, work with food pantries, local organizations, our Court Appointed Special Advocates Program and much more. Look to link with us for events like our annual Spirit of Volunteerism Awards, our Hanover Global Youth Service Day Kick-Off Event, and Service Fair! i would really like to work with kids..